A new Nintendo DS game is helping kids monitor a disease that is typically tough to manage. Pharmaceutical company Bayer has announced a new piece of technology for those affected by diabetes that works in tandem with the Nintendo DS. The Didget blood glucose monitoring system works just as you would expect, but also plugs into a DS to give users bonuses. 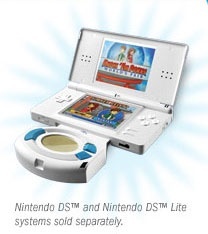 DSi and DSi XL owners need not apply, as Didget requires the Game Boy Advance slot to work. Plugging Didget into this slot will award those who have been testing their blood in a game called Knock 'Em Downs: World's Fair that comes with the meter. In Knock 'Em Downs, players choose to be either Hunter or Britney as they attempt to save the fair from Carnie Cal, who was recently banished. The goal is apparently to foil his plot before it's too late and he... gets back into the fair? Bayer didn't say exactly what Carnie Cal is up to, but he wears a top hat and has a twirly mustache, so he must be evil incarnate. If it were me I probably would have gone with a Legacy of Kain tie-in. Insensitive? Players of Knock will solve puzzles and visit seven unique lands. Testing regularly will unlock points that can be redeemed for new characters, mini-games, costumes, and more. Didget owners can also have individual pages on the Didget website where they can upload scores to leaderboards and unlock even more features by connecting Didget to their computers. As diabetes can be a hard illness to live with, I think tying it into playing the DS and to social networking is a really great idea. With the Nintendo DS being used in schools, to help people quit smoking, to learn to cook, to become better McDonald's employees, and now saving lives, is there anything it can't do? The 3DS will probably end up helping us travel to to parallel universes, or at least give us a portal to look into them.